Marvelous Designer is a 3D clothing designer program for use in other programs, such as Maya, DAZ Studio, Poser, and more. In addition, it can be a valuable tool for clothing designers to use as a proof of concept for their designs, construction methods, fabric draping, and sizing. 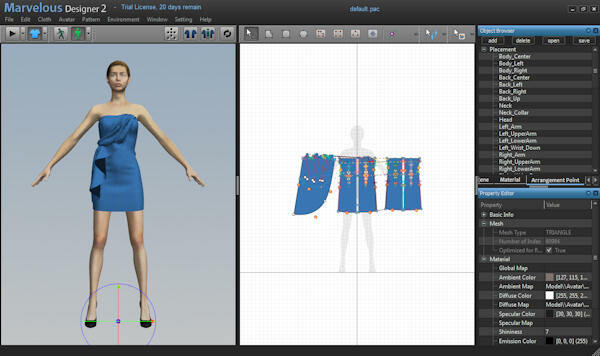 The software allows the clothing to be created without using additional CAD software which can be a boon for struggling designers or hobbyists. Vendor: CLO Virtual Fashion Inc. Installation: Installation is similar to most software programs although it does use online authentication to ensure that the user is licensed and is not using more licenses than they have available. Demo users have 30 days to try out the program with all features enabled, on one computer. I really like that the demo is fully functional since it allows you to use the software without missing out on features or finding out too late that something doesn’t fit your needs. User Manual: The user manual is currently a work in progress but it is obvious that English is not their native language. There are grammar and punctuation errors as well as incomplete or confusing instructions. As a professional technical writer, this makes me twitch each time I try to use the manual. That being said, they have some excellent video tutorials available, although they do not have voice overs which requires more rewinding than should be necessary since the menu commands and fields are too small to see what is being done. There are also several tutorials in the forum, for example, the outfit in the main review image above is in the forum and also available as a download. The user manual accessed from the main menu is an older version of the manual which caused issues since I couldn’t find help on items I was looking for. Downloading the updated manual from the website provided me with some of the help I needed and the forum moderators helped with the remaining issue. Loading: The program loads fairly quickly even on my outdated laptop. The software recommends that you update your drivers to the latest version of OpenGL which will enhance the way the program handles. While I have an older version of OpenGL installed, the program worked as expected and I was pleasantly surprised that it never crashed. Ease of Intended Use: I am going to compare this program to Optitex since I’ve used it previously when I worked for DAZ3D and was documenting their Optitex plug-in. I was able to easily learn the basics of using Optitex but I think that was because I’ve been sewing since I was nine years old, but figuring out how to actually do things was more difficult. Of course, Optitex is geared towards the garment industry and high end designers while Marvelous Designer is geared more towards hobbiests and smaller design firms. As a result, it is set up more like a 3D modeling program that most 3D artists are familiar with, such as with an Object Browser and Property Editor. Menu commands aren’t hidden in multiple sub-menus and properties are easy to locate in the Property Editor. Arranging pattern pieces around the avatar is similar to Optitex but seems easier to accomplish. Modules and Features: Marvelous Designer does not currently have extra modules that have to be purchased separately although they are working on a plug-in that can be used with the Optitex plug-in for DAZ Studio. 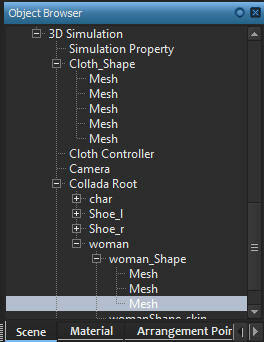 The exported clothing meshes will work immediately in the Poser Cloth Room as long as they are correctly grouped to work there. The main workspace loads with the default avatar and clothing item loaded. Choosing File > New from the menu removes the clothing item leaving the avatar ready for a new outfit. The left hand window displays the loaded avatar and the clothing item. This window provides real time updates to the piece of clothing as you modify the associated pattern pieces. 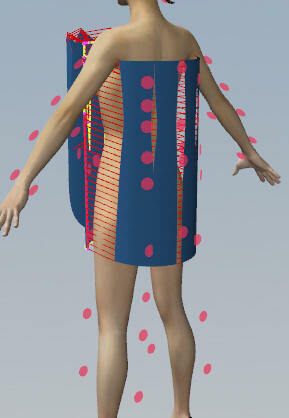 The avatar can be rotated in order to view the pattern piece placement and fit. The middle window displays the pattern pieces overlaid on a silhouette of the avatar for more accurate dimensions and placement. Note how the front of the dress is over the silhouette, the back is to the right and the drapery is to the left, where it will be located on the actual dress. The far right windows display the Object Browser and Property Editor. 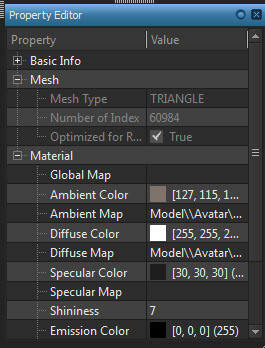 At the bottom of the Object Browser are three tabs for the Scene items, Materials, Arrangement Points, and Arrangement BV. Arrangement points are used to place the pattern pieces more accurately around the avatar while te Arrangement BV is the bounding volume of the points (similar to a bounding box). The Object Browser displays the different objects in the scene for the 2D pattern design and 3D simulation. As you select items in the different tabs, the Property Editor updates to display the matching options and current settings for that item. Properties that cannot be modified will be grayed out while those that can be modified will be shown in white text. Double-click on a field to activate and edit it. Pattern pieces are drawn using connected points that can be drawn as a polygon, rectangle, or circle. 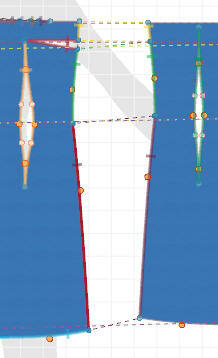 Additional points can be added as well as converting them to 3 point curves and anchor points. The 3 point curves can be used to quickly create necklines and armholes in a basic pattern piece. For example, it is easier to create the front of an outfit without the actual neck or arm holes, then create them later by adding a 3 point curve in the right location. Darts and openings can be created as well as fold lines, pleats, tucks, gathers, and fold lines. Static items such as buttons and attachments (flowers, bows, etc.) can also be added and placed on the clothing. In addition, clothing can be layered so as to correctly tuck shirts into slacks, wear a jacket, etc. This can easily be seen in the first image in this review. Pattern pieces are seamed by “sewing” them together which can be done by connecting them to match up between points on the piece or by free sewing an entire section and ignoring the sections between points. The image below shows the seams as colored “crosses” on the edge of the pieces connected by matching dashed lines. These seams are also visible around the avatar as red lines. When arranging the pattern pieces around the avatar, arrangement points are used to more accurately place them around the figure. When using an imported figure, arrangement points can be created specifically for that figure. Some may be available for download from the software website if the figure is popular enough, such as for DAZ’s Victoria 4. Figures can be imported into MD2 when exported either in Collada or OBJ format from the other program. You can also import the figure in different poses so that the draping occurs as the figure morphs from the standard pose to the required pose and adjusts the cloth to match. Of course, you’ll still need to group and rig the clothing for DAZ Studio and Poser, but modeling the outfit is usually the hardest part. 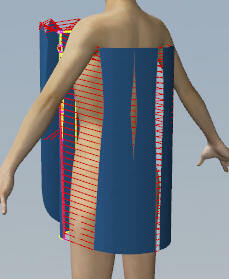 Once the pattern pieces are placed accurately around the avatar, draping occurs quickly and fairly smoothly. Textures can also be added for a more accurate representation of the clothing using the high quality real-time renderer. In addition to clothing, MD2 can be used for cloth, pillows, and who knows what else. There are additional features such as pinning the cloth and more that really need to be played with as you go. Texturing is easier when using pattern pieces since the textures are applied just like you would if you were cutting out the pieces from fabric. When I’m working on a piece of clothing, I usually UV map it to as closely match real pattern pieces as possible. Using MD2 just makes it easier for me. Available FreeStuff: The MD2 website provides quite a few example clothing items that can be downloaded and studied. Use them in addition to the video tutorials and forum posts to learn how to use this program to its full potential. Licenses and Cost: Marvelous Designer currently has two different licenses, one for personal use and one for a small business. The personal license is $99.00 with distribution of 3D items created in the software on a non-commercial basis only. Distribution and sale of 2D images and animations made in the program is allowed. Use is prohibited for companies, government agencies, and educational organizations. An upgrade to the small business license from the personal license is $600.00. The small business license is $699.00 with distribution and sale of all 3D and 2D works created in the software allowes. Use is for individuals or companies with 10 or fewer employees. Use is prohibited for companies with more than 10 employees, government agencies, and educational organizations. For companies with more than 10 employees, government agencies, or educational organizations, contact the sales department. A 30-day demo is available with all options enabled. You will need to create an account in order to download and authenticate.